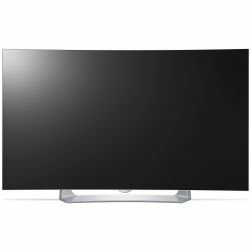 LG's EG9100 Series 55"-Class Full HD Smart Curved OLED 3D TV is designed to deliver wide viewing angles, deep black levels, content sharing, and an immersive display. This model's 1920 x 1080 native resolution allows you to enjoy detailed Full HD images. This TV is endowed with a 55"-class curved OLED panel that's designed to produce exceptional black level performance. As a smart TV, the EG9100 series features Ethernet and Wi-Fi connectivity, which allows you to browse LG's webOS 2.0 intuitive user interface, app store, and web browser. LG Screen Share and Content Share technology allows you to share media with compatible smart devices. For connecting multiple high-definition sources, this OLED TV is generously equipped with 3 USB and 3 HDMI inputs. It has also has a component video input that doubles as a standard composite video interface for connecting lower resolution sources. Additionally, this TV has two built-in speakers for a combined 20W of audio power, and a digital optical interface for connecting to external audio systems. In addition to the inclusion of LG's microphone-equipped LG Magic Remote, the EG9100 series includes two pairs of passive 3D glasses for enjoying the 3D content.